Located on the island of Mykonos, Greece stands Mykonos Villa Crew, which is comprised of two private villas. Boasting one of the best sunsets on the island, both private villas host 5 large bedroom suites, accommodating up to 10 guests. Mykonos is Greece’s most famous cosmopolitan island, giving its locals and visitors 300 days of sunshine. Located in the middle of breathtaking a landscape, sits Villa Orpheus, which overlooks ancient Delos, and Villa Eurydice, which overlooks the town of Mykonos. Complete with experienced housekeeping, and a private chef on request, your stay at Mykonos Villa Crew will be one of a fairy-tale from its crisp whites, to its peaceful views and energy. Beyond the 12-foot gate leading into this Trousdale Estates home, is the $9.9 million home that was recently rented out by Jennifer Aniston and Justin Theroux. 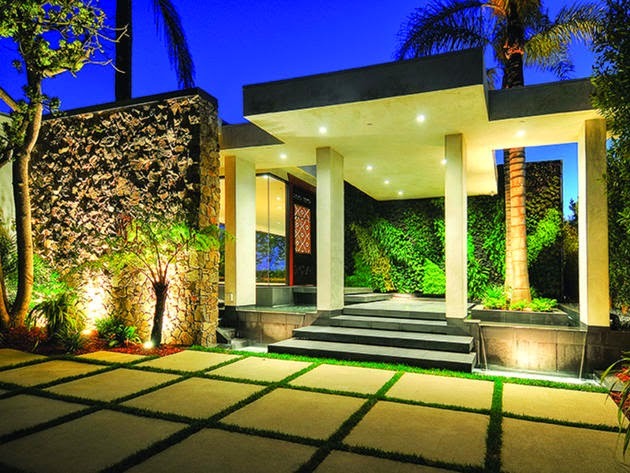 The dramatic entryway, which is constructed of honed basalt and water features, gives way to a beautiful, modern home. The property, which spans close to half an acre, opens up to a zero-edge lagoon pool and spa in the backyard, which also features a Lynx outdoor kitchen. Floating appliances and a stainless steel island add a sleek and modern look to the estate’s kitchen, as slate floors and warm bronze and striped walnut cabinetry flank the walls and floor. Best of all, is the master bedroom, which offers marble his and her baths, and heated flooring. 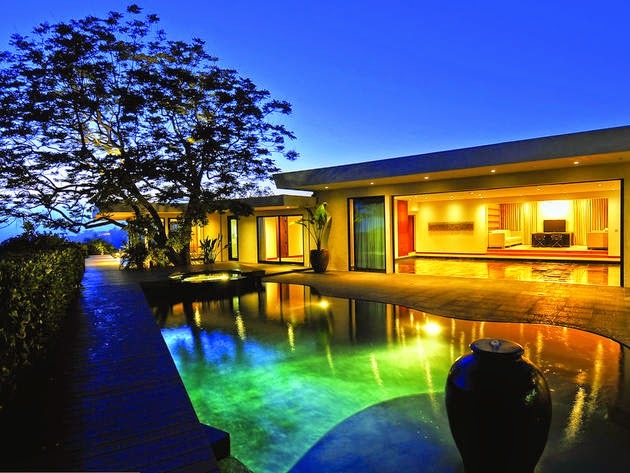 With unobstructed views of Los Angeles and the Pacific Ocean, is this a home that you’d love to come home to every day? Do you ever find yourself debating what to do with your spare room, and whether to turn it into a dining room, an office, or an additional TV room? One of the hottest trends popping up in spare rooms and basements, are luxury game and media rooms. Game rooms do not have to be painted in crazy colors or designed in an eclectic style; instead, the look can simply be whatever you prefer. Media rooms are also not limited solely for large TVs or billiards. Media rooms can simply be a room to gather in for board games, parties, or both movie watching and game playing. If a media room for watching movies is your theme of choice, consider stadium style seating, large popcorn machines, and a large movie screen. A secluded area can be reserved for a mini fridge and a wet bar. If you’d prefer a media room to serve multiple purposes, consider dividing areas of the room for different purposes. While one area can be for serving snacks or sitting down to eat, other areas could be designed for watching TV or playing board games. If you were to design a game room for your space, would you prefer a home theater, or a game room? The most daring shade of them all is fresh and vibrant, bringing happiness into every room it’s found in. You don’t need a lot of this color to make a major impact, as a little goes a long way. Lime green is the color of the month, and with the right combination, your room will dramatically stand out. The wonderful thing about lime green is that less is more. Several accent pieces or an accent wall is enough to draw the eye into the room and make a lasting impact. 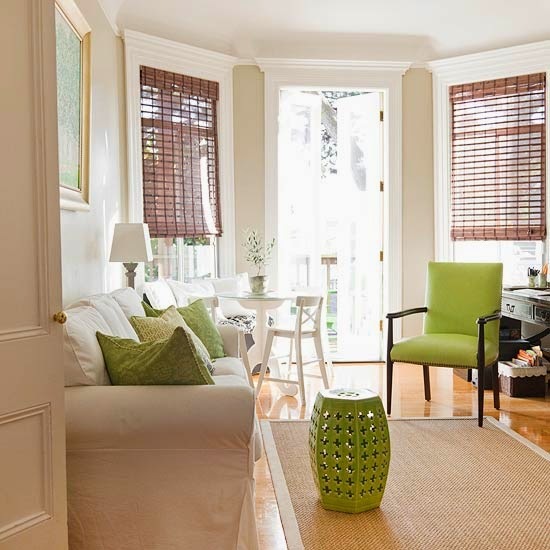 Lime green pairs wonderfully with neutrals, as the colors don’t compete with one another. If going big is more your scene, bring the vibrant color to your ceilings or walls. Bringing color to your ceiling isn’t excessively common, so the mere idea of splashing lime green above invokes energy, pizazz, and a feeling of freshness. How do you feel about lime green in your home? Would you subtly add the color in, or would you go for the wow factor?